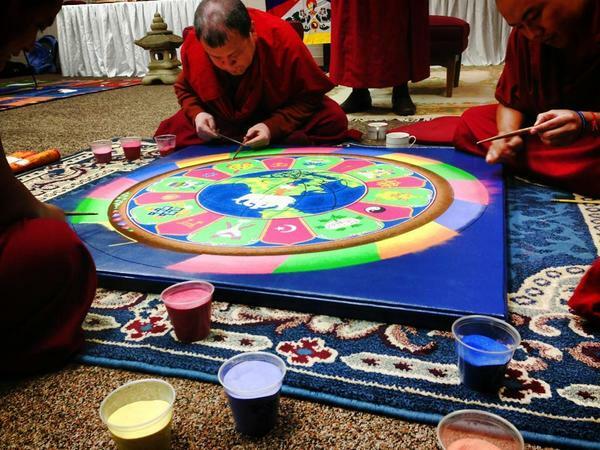 Monday, September 24: Opening Ceremony at 10:00 a.m.
Tuesday through Thursday: Monks creating the Peace Sand Mandala from 9:00 a.m. to 5p.m. Friday, September 28: Closing Ceremony at 10:00 a.m.
All are welcome to observe this amazing intricate process and spend time with the monks. Continuing the ecumenical monastic tradition begun between Thomas Merton and the Dalai Lama, we have invited the monks to reflect on the common goal of compassion among all religious traditions and philosophies in the response to suffering. Upon completion, the Sand Mandala is dismantled to symbolize the impermanence of all that exists.